Built in 1952 by Hong Kong Tramways. 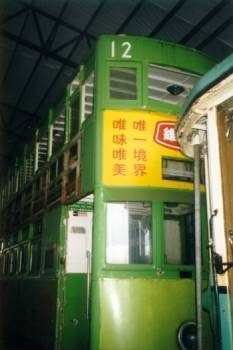 Double-Decker #12 car was built in 1952 by and for Hong Kong Tramways. The car was retired in 1985. It was shipped to Vancouver BC for Expo ’86. Hong Kong built a replacement #12 in 1987. The original #12 later found its way to Portland. 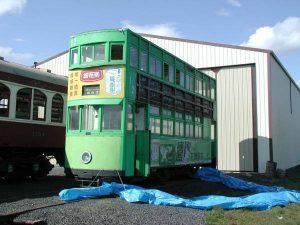 Mr. Bill Naito wanted to start a heritage trolley line in Old Town Portland. So he was acquiring cars to start the trolley line. Those plans were scuttle in favor of Trimet acquiring replica Council Crest cars that could operate on the MAX Light Rail line. 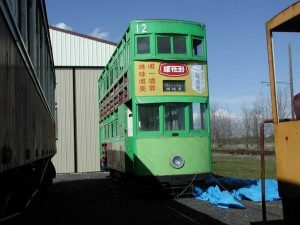 The car was stored for many years before it was offered to our museum. The car lacks motors and it is narrow gauge so it may not ever operate again. However, it is a fine addition to the collection. Just watch your head. The ceilings are a little low! 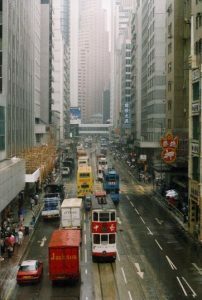 Cars similar to this still operate in busy Hong Kong!